Multi-instrumentalist Paul Whitley learned to play drums with 8 years. With 16 years he started playing piano, before he finally chose bass and guitar to his favorite instruments. Since 2002 he started his career as professional musician playing with artists such as Marvin Sapp, John P. Kee, Byron Cage, Wes Morgan, Myron Butler, Steve Cole, Walter Beasley, and Joey Sommerville. 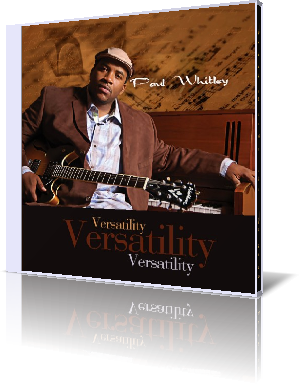 With Versatility (2011) Paul Whitley presents his first solo album. The album offers a fine mix of covers and Paul's own compositions. Paul is supported by Lamont McCain (bass), Reggie Graves (guitar), Rischard Jenkins (drums), Jerry Oates (horns), Tony Bowers (guitar) and many more on selected tracks. The title track seamlessly connects to the roots of Motown music of the eighties with surprising turns and twists. Groovin' Time lets the funk flow, cool and dirty. Shan "Shableek" Richardson considers himself a saxophonist evolutionary, taking the way jazz is viewed to another dimension. On this song he keeps his promise. Let's Ride is Paul's personal tour de force showcasing all musicians with their great talents. You Are The One was written by Nicci Canada, who also makes the background vocals on this song featuring singer Blanche Johnson. The tune is somehow plugged in a programmed rhythm, which weakens slightly the emotional impression. With definite elegance Paul Whitley caresses the keys on So Incredible featuring singer Montrell Calhoun. But there is far more to discover. For example how intensely all musicians deliver their own parts. There is also a place for romance on this album. Lost Without Your Love showcases great vocal and instrumental harmonies. More Of You, Midnight Breeze and I Adore You More present in direct line the intimate background for cozy moments. Tony "T Lelo" Bowers shines equally as lead guitarist and singer. Monte Carlo is the principle city in the heart of Monaco. The attractive place is the center of European richness, classiness and laissez-faire. This magical dream world is celebrated in Paul's Monte Carlo, a Bossa Nova flavored song. You're So Good is a glooming melanche of R&B featuring Trina Houston and Whitley's jazzy versatiltiy on piano and Reggie Graves' lead guitar. Also exeptionel Jerry Oates on horns. With My Worship Whitley showcases his mastery on organ and other instruments celebrating his relgious heritage. The powerful commitment Material Things sets the final highlight. Versatilty is the capability of doing many things competently. A favorable aim for all musicians. Paul Whitley has every right to name the album after this nominative.